8 CDs. 9:45 hrs. Recorded Bks. Feb. 2018. $87.75. ISBN 9781501972249. digital download. Gr 9 Up—In the small desert town of Madison, UT, everyone is given a single wish on their 18th birthday. In the past, people have been granted beauty, love, athletic prowess, and wealth—things with no impact outside of their secretive community. Eldon's 18th birthday is fast approaching, and his mother wants him to wish for money in hopes that it will help Eldon's sister who is in a vegetative state after an accident. Meanwhile, Eldon thinks he'd be happier not having to go through with it at all after having spoken to others about their experiences. As it turns out, getting exactly what you want isn't all it's cracked up to be. Brian Hutchison narrates and does a credible job reading Eldon's character while also differentiating among the supporting cast. His warm, approachable voice leads listeners to relate more closely with the conflicted Eldon, whose selfishness, confusion about wishing, and hostility toward many of his classmates and former friends make him often unlikeable. 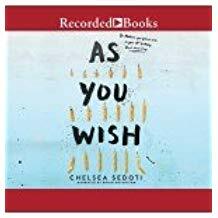 The Wish Diary interludes, which are third-person accounts of selected Madisonians, are handled by Hutchison with appropriate somberness, and he perseveres though the thought-provoking yet slow-moving plot. VERDICT An additional purchase only where magical realism and studies of human nature are popular.